An Action reflecting a Glib::Object property. 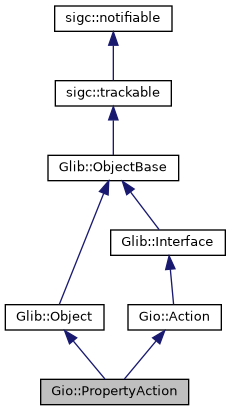 A PropertyAction is a way to get an Action with a state value reflecting and controlling the value of a Glib::Object property. The state of the action will correspond to the value of the property. Changing it will change the property (assuming the requested value matches the requirements as specified in the GParamSpec, used when the property was installed). Only the most common types are presently supported. Booleans are mapped to booleans, strings to strings, signed/unsigned integers to int32/uint32 and floats and doubles to doubles. If the property is an enum then the state will be string-typed and conversion will automatically be performed between the enum value and "nick" string as per the GEnumValue table. Flags types are not currently supported. Properties of object types, boxed types and pointer types are not supported and probably never will be. Properties of Glib::Variant types are not currently supported. If the property is boolean-valued then the action will have a nullptr parameter type, and activating the action (with no parameter) will toggle the value of the property. In all other cases, the parameter type will correspond to the type of the property. The general idea here is to reduce the number of locations where a particular piece of state is kept (and therefore has to be synchronised between). PropertyAction does not have a separate state that is kept in sync with the property value – its state is the property value. For example, it might be useful to create an Action corresponding to property_visible_child_name() of a Gtk::Stack so that the current page can be switched from a menu. The active radio indication in the menu is then directly determined from the active page of the Gtk::Stack. An anti-example would be binding property_active_id() on a Gtk::ComboBox. This is because the state of the combobox itself is probably uninteresting and is actually being used to control something else. Another anti-example would be to bind to property_visible_child_name() of a Gtk::Stack if this value is actually stored in Gio::Settings. In that case, the real source of the value is Gio::Settings. If you want an Action to control a setting stored in Gio::Settings, see Gio::Settings::create_action() instead, and possibly combine its use with Gio::Settings::bind(). Creates an Action corresponding to the value of property property_proxy. The property must be existent and readable and writable (and not construct-only). This function takes a reference on the property's object and doesn't release it until the action is destroyed. name The name of the action to create. property_proxy The property to bind. invert_boolean If true, the state of the action will be the negation of the property value, provided the property is boolean. If the action is disabled then calls to g_action_activate() and g_action_change_state() have no effect. If true, the state of the action will be the negation of the property value, provided the property is boolean. This is mostly meaningful for identifying the action once it has been added to a ActionMap. The type of the parameter that must be given when activating the action. The state of the action, or nullptr if the action is stateless. The VariantType of the state that the action has, or nullptr if the action is stateless.